Your account had been updated. Your M life Rewards tier will be matched to your World of Hyatt tier. Please allow up to 24 hours for your new tier to reflect on your account. This is how you will access exclusive offers through your M life Rewards account online. Passwords must be at least 8 characters with at least one number, one capital letter, and one lowercase letter. Due to certain gaming regulations, we must collect birthdate for members of the M life Rewards program. Phone number must be 10-16 digits in length. Due to certain gaming regulations, we must collect an address for members of the M life Rewards program. This will allow us to identify you if you have trouble with your account. Please Select What is your mother's maiden name? What was your first pet's name? Which city were you born in? What was your first car? What is your father's middle name? Please enter the answer to your security question. MGM Resorts International seeks your consent, on its own behalf and on behalf of its resorts, casinos and properties (collectively, MGM Resorts Properties), to send you marketing emails and other electronic communications. I wish to receive marketing emails and other electronic communications from MGM Resorts International and current and future MGM Resorts Properties. I understand that I may withdraw my consent at any time. 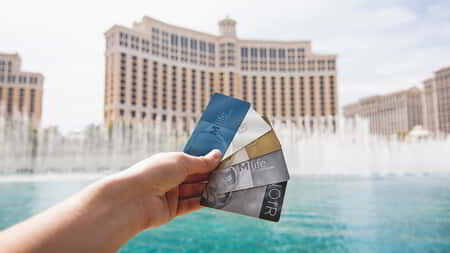 M life Rewards also offers amazing flexibility with the ability to enjoy benefits and redeem rewards at MGM Resorts Destinations in Las Vegas and beyond.